So I put in the cute little 4″ brass porthole over the sink, and am refitting an old baby buggy to be a dog and/or grocery carrying buggy. I’m trying to get the cockpit canvas tent job finished despite the client’s inclination to over think the project, micromanage, and change the design every other day. There are two other canvas jobs after his. But I feel blah. Ennui i’tis. Or maybe I’m leaden with the constant reminders of mortality I have been getting of late. Two friends with cancer, the spirit of Larry lurking and needing to be talked to, time to scatter my father’s ashes after his urn spent 4 years in a closet. I’m sure a productive visit with my muse would help me get past the question “What’s the point?” but for the moment I’m just marina flotsam. The Lat38 editor kindly sent me the photo she took of me and Austin on the boat on the hard. I include it here. 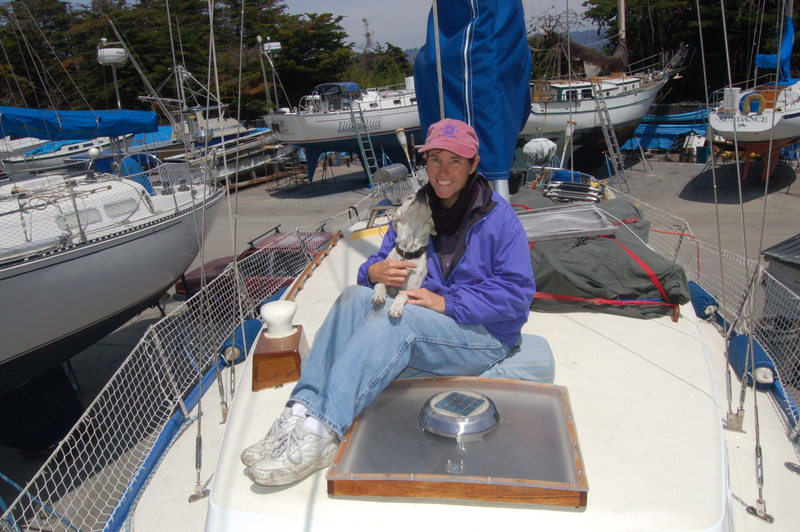 This entry was posted on Friday, July 16th, 2010 at 8:29 pm and is filed under Cruising Life. You can feed this entry. You can leave a response, or trackback from your own site. Hang in there, Point the Bonita north in the spring and visit us in Homer. HA ! You are so funny. North, indeed. Not like I have an enormous shrimp boat to power up there or anything. Enjoy the frigid surfing, y’all.